Pull up a stool, put a few quarters in the jukebox, and let me pour you a tall glass of soul. Today I debut my latest painting, “Absolute: Struggle”. That’s right, we’re about to get our blues on and it’s never been so blood red. “Absolute: Struggle” ain’t your run of the mill moody-broody piece that emotes for the sake of being dark. That’s not my style. No, this piece ranks among my most pure soul-inspired paintings to date. It’s part of my deep blues repertoire. And I feel like the most potent blues aren’t merely explorations in pain, but rather a catharsis by the trumpeting of hope through tribulation. For every edge of despair there’s a modicum of pure unbridled exaltation in how one can still feel deeply. This is one of the absolutes in our lives – that we can (and often do) have a duality of conflicting emotions that are so pervasively deep and yet so polar opposite. I set out to portray this abstract concept in this painting. Like with all blues, nobody wants to hear your song if it’s not a self-portrait of soul. So swill your spirits and scoot closer to the bar. This solo continues after the image. As with all of the Absolute Series, the work is multilayered with tiers that range from the simplicity inherent in the wow-factor to the esoteric of deep symbolism. This piece is no different. 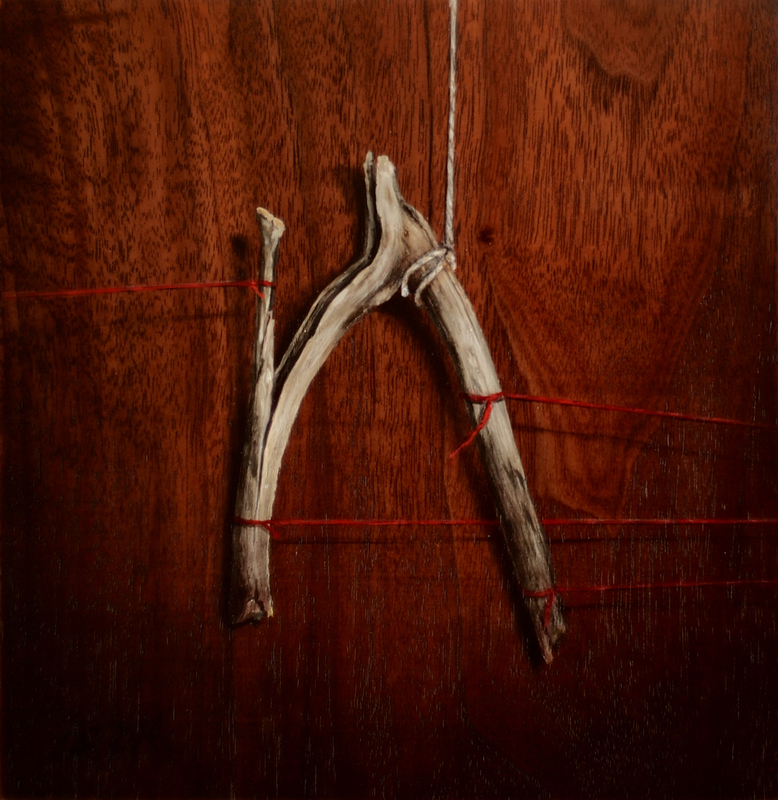 A warmth of familiarity and richness of color is combined with the blatant tug and pull of a splitting and dried up stick. If you see a similarity in this crux of wood to a wishbone, that’s intentional. I saw it too. In fact, that’s exactly why I picked it up while hiking through the woods. Wishes are relative. They are expressions of want onto which forces are applied. It’s Summertime. And I really like my Summertime. But where there’s warm sunny days there’s also rolling thunderous nights. This stick has been bleached by the sun’s radiance, bloated by the rain, dried by the convection of summertime heat, split by stress, and is clearly being pulled in many ways. Yet… there’s a truth, an anchor point; An Absolute that holds this weathered stick upright against all other forces. Therein lies the paradox. With so many forces, will it snap under the crimson pressure or will the Absolute Truth turn the blues back into Blue Skies? “Absolute: Struggle” Oil on reclaimed walnut 7.23.14. Oil on reclaimed walnut 7.23.14. After a marathon first & second sessions of painting. Everything looks better after the shadows are included.